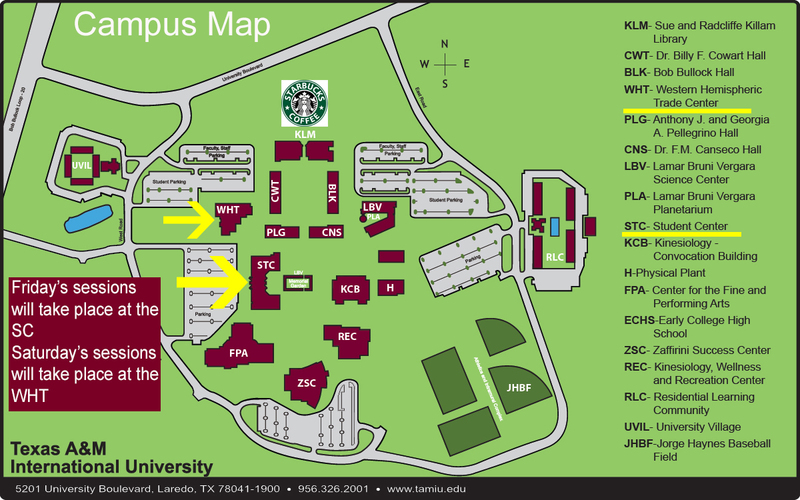 For everyone interested in attending the TAMIU 2016 Conference on Latin American Communication Research in Transnational Settings, we have selected three different hotels near the university and a few dorm rooms will be available for students willing to share a room during the dates of the conference. Double rooms $57 per night plus tax. CODE: TAMIU Communication conference. Double rooms $92 per night plus tax. Includes breakfast and transportation to and from the airport. CODE: TAMIU Communication conference, RSVP by Mar. 24. Double rooms $89 per night plus tax. Includes breakfast. CODE: TAMIU Communication conference. When making your reservation make sure to mention the code in order to have access to the special rates. Experience ultimate flexibility and empowerment with creating your-own pasta featuring a smorgasbord of fresh vegetables, grilled chicken, and parmesan cheese or try one of our daily Mediterranean casseroles or entreés. Complete your meal with a signature roasted garlic Asiago roll. Delicious! Hours: 10:30 a.m. to 7:00p.m. Grille Works features mouth-watering grilled sandwiches with appetizers including familiar favorites like French fries, onion rings, and mozzarella sticks. Don’t forget to try our quesadillas and taco salads, too. Hours: 10:30 a.m. to 8:00 p.m. Enjoy your choice of SUBWAY® selections, including your favorite made-to-order sandwiches, soups, and personal pizzas. Hours: 7:30 a.m. to 8:00 p.m.
Chicken sandwiches, salads, wraps, and soups. Fill all your grocery and convenience needs. From snacks and beverages, to frozen foods and sundries, we have what you need to survive – without having to leave campus! 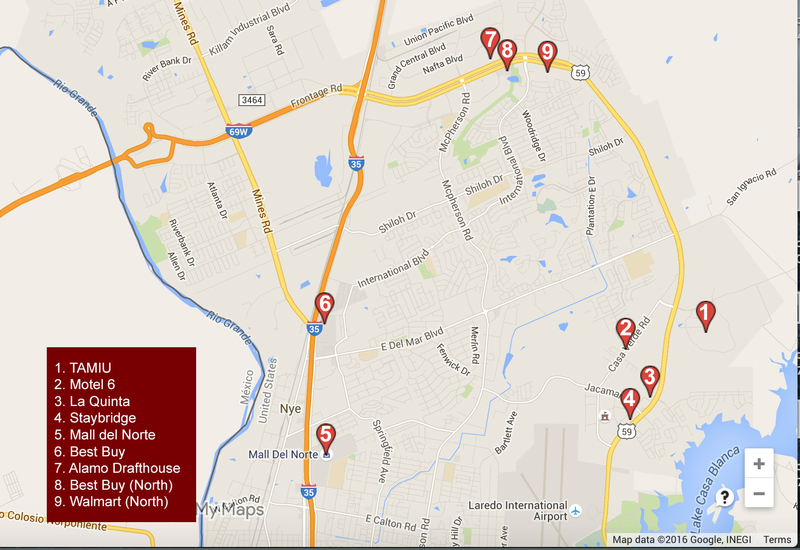 The following restaurants are fairly close to TAMIU and are among the top Laredo favorites. Restaurant-bar offers a changing selection of craft beers and casual Latin inspired pub food. Business hours: 5 p.m.- 10 p.m.
Japanese cuisine with a Mexican twist. The menu includes sushi bar, yakisobas, teppanyakis, salads, and other dishes. Special combo: full sushi roll, mixed rice, and choice of soup or salad for only $8.99. Restaurant-bar serving gourmet Mexican-inspired seafood, steaks & cocktails. Tabernilla is the place for true tapas lovers! A little of Spain through food and drink. Modern and Classic Spanish Tapas, Entrees and Desserts. Busy American eatery serving familiar fare & cocktails in an unpretentious setting with a patio. For campus related emergencies call 956-326-2911 or the Campus Police Department at 956-326-2100. For any immediate emergencies call 911 or the Laredo Police Department at 956-795-2800.